The Medieval Lace-Up Tunic is a simple but none-the-less attractive tunic that can be used in the creation of a dozen or more different types of looks. From pirates to poets to peasants and more, this tunic looks great in a variety of styles. Made from 100% natural woven cotton, this tunic has an authentic and rustic look combined with the ease of care found in most modern garments. The tunic is also quite comfortable to wear and provides a modicum of protection from the elements when worn. This tunic laces half-way up the front, from approximately mid-chest to the neck. The sleeves are full-length and comfortably fitted to the arm. This tunic also has a hem that extends down further then the waist, the hem is just barely knee-length. 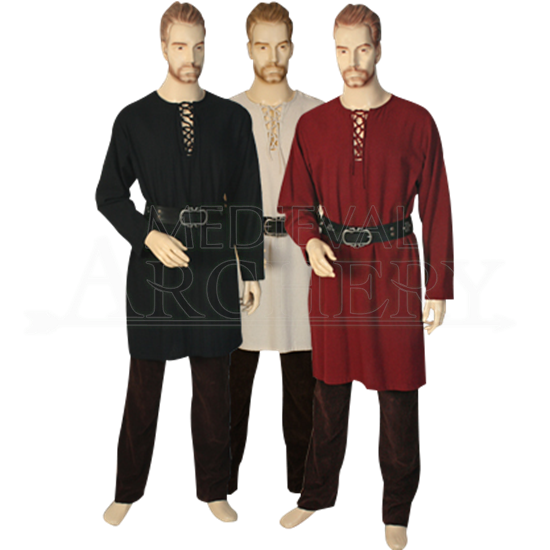 The Medieval Lace-Up Tunic is available in a variety of attractive colors. The tunic is pictured here with a belt and a pair of trousers, which are not included. A tunic is something of a catch-all garment, one that can be used virtually anywhere, with any type of look, because everyone wore tunics at one point - romans wore tunics, pirates wore tunics, poets wore tunics, serfs wore tunics, and knights wore tunics. And if everyone wore tunics, then anyone can wear the Medieval Lace-Up Tunic with relative ease.